Posted June 13, 2016 by Melissa Slive & filed under Blog, In the News. After you’ve finished your education, what path through life should you take? This is a question all are faced with when seeking their first job after graduation. Armed with the generic advice “follow your passion,” many students feel lost or unsure of their direction. 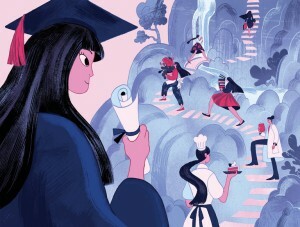 This article discusses the steps graduates should take when building their future to ensure they find a job that will foster their interests. Click here to read this article by Angela Duckworth.